Balloons are what everyone would consider as staples to parties or events, so it’s not surprising that they are also becoming popular pieces of décor at weddings. 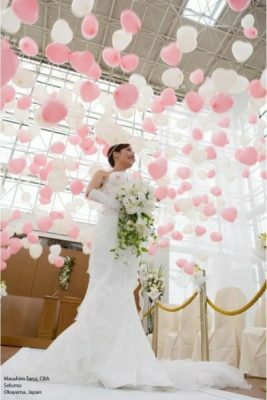 With the variety of balloons to choose from, you can easily have fun being creative about how to decorate your wedding. If you feel stumped for ideas, you’ll find pages of wedding balloon décor inspiration from a simple online search at the tip of your fingers. 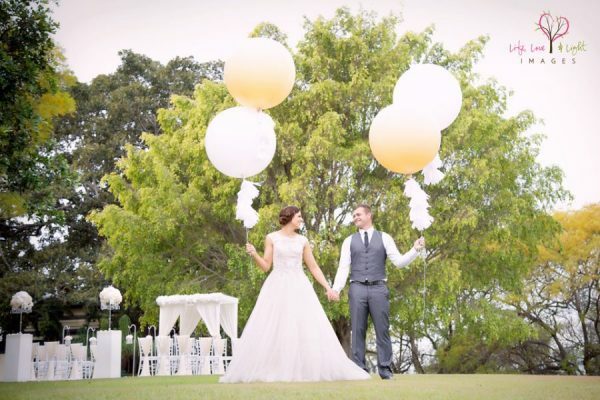 We’ll take you through some of the biggest and most popular ways couples are styling their weddings with balloons. As you and your partner walk down the aisle, exchange your vows, and finally officiate your marriage, you’ll want your ceremony décor to be as stunning and spectacular as it can be to match this wonderful occasion. For example, you can add balloons to your wedding arch, and style it with matching accents of flowers and other décor to make for a beautiful and sophisticated wedding ceremony theme. If you’re holding your ceremony indoors, arranging balloons either tied to the floor or released on the ceiling can be all that it takes to create a more memorable and attractive look for your wedding ceremony. The reception is where all your guests can let their hair down and enjoy celebrating your marriage with good music and delicious food, and what better way to set the mood than with an array of spectacular balloon décor! You can place balloons to cover up empty space on walls, hang them on the ceiling, or even place on tables and chairs. But make sure to not overdo it that it becomes a distraction or blocks out views for certain guests. 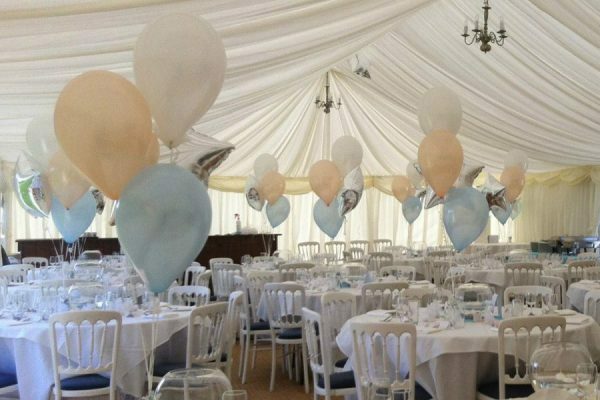 If your wedding is especially large with many guest tables at the reception, you can set up numbered balloons on every table to help all your guests easily find their way – whilst also making for a delightful and fun experience for everyone. Go for a simple colour or design (like plain white, silver, gold, etc.) 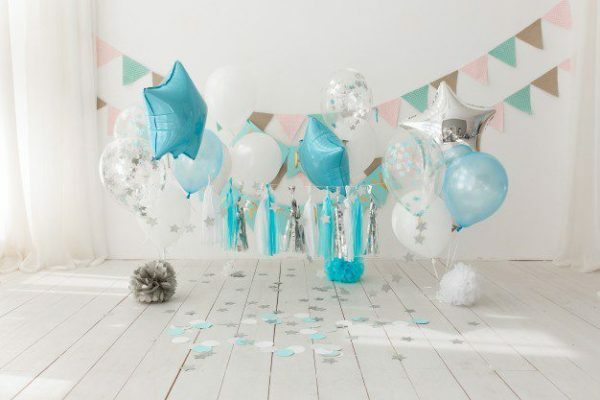 that coordinates perfectly with the rest of your wedding theme, since the balloons stand out by themselves and shouldn’t be too bold that it detracts from the main events at your reception. Setting up a photobooth is a great way to capture great memories and allow your guests to have a bit of fun using a range of different quirky and cute props. To take your photobooth game to another level, you can arrange a photo booth backdrop filled with balloons – you can get creative with different colours, sizes, and additions of flowers or other décor items. 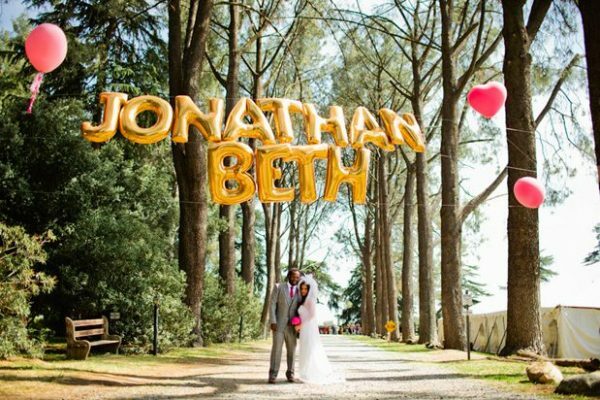 Not only are balloons lovely additions that enhance the look of any wedding, using lettered balloons can be a great way to showcase sentimental messages for you and your guests to remember. It adds a unique touch and gives you the option to personalise your wedding even more. 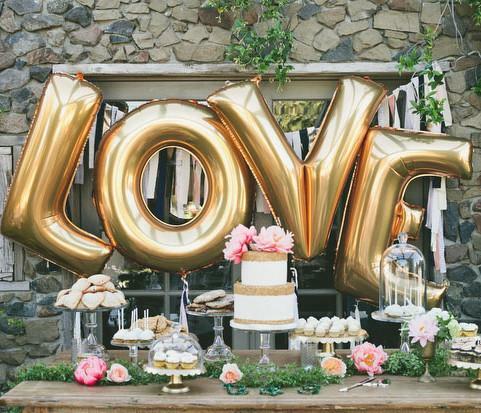 You could use lettered balloons that readout you and your partner’s name or even a simple phrase such as ‘I love you’ which adds a cute touch to your overall wedding theme. 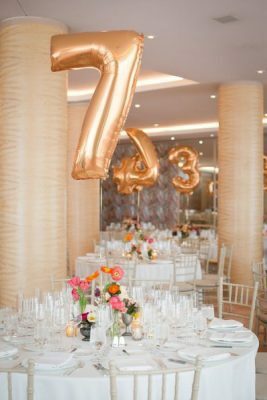 Whether it’s numbered, lettered, big or small, balloons are a great way to amp up the celebratory atmosphere in any wedding. And with the massive selection and balloon types, you can design and arrange them that fits perfectly into your desired wedding theme. If you’d like to see more inspiration or need help planning out your perfect wedding, feel free to get in touch with our team at Circle of Love by simply filling out a contact form today. Alex Morrison has worked with a range of businesses giving him an in-depth understanding of many different industries including house cleaning, financial support and health care. As the owner of Integral Media, he is now utilising his knowledge and experience with his rapidly increasing client portfolio to help them achieve their business goals.